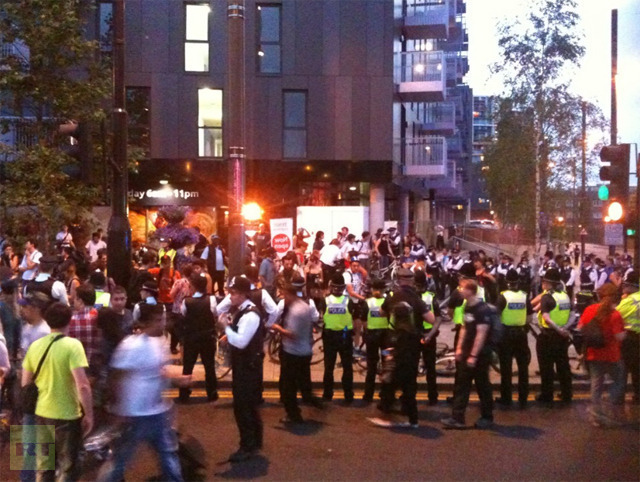 More than 100 people were arrested last night during a Critical Mass bike ride. The trouble occurred close to the Olympic Stadium as the Opening Ceremony unfolded. According to the Metropolitan Police, two groups were detained under Section 12 of the Public Order Act: one near Bow Flyover and the other on Warton Road, Stratford. The Critical Mass bike ride is a long-established event that takes place on the last Friday of every month. It is usually a well-organised event to promote safe cycling. Last night's ride was subject to tight restrictions, barring participants from heading into areas north of the river "to prevent serious disruption to the community and the opening ceremony of the Olympic Games," as the Met put it. It seems the ride breached these restrictions, and riders were detained as a result. Some cyclists claim that the police were heavy-handed in implementing the restrictions. Accusations of kettling, police aggression and use of pepper spray have been made, which the Met have yet to respond to. Another report suggests that "There was little tension evident and officers were seen chatting and joking with the detained cyclists". This video from earlier in the day, near Blackfriars Bridge, would beg to differ.